The Pimsleur Method provides the most effective language-learning program ever developed. The Pimsleur Method gives you quick command of Cantonese structure without tedious drills. Learning to speak Cantonese can actually be enjoyable and rewarding. Dr. Pimsleur was a language educator for over 20 years. He noticed that children have an amazing ability to learn new languages--quickly. That's why there are so many bilingual 5-year olds. Dr. Pimsleur spent his life developing this course to let you, as an adult, learn French as easily as a child would. You might not realize it, but you've already learned one language using the Pimsleur approach. Your first language! The entire Pimsleur approach is what language learning should be: quick, fun, and easy! Many foreign language students have difficulty learning. Their textbooks teach monotonous drills, grammar rules, and random lists of words. But textbooks alone can never bring it all together. Your only real goal in taking any Farsi course is to speak Farsi naturally with others. Dr. Pimsleur designed each lesson as the foundation for the next. In other words, you'll keep building on what you've previously learned. 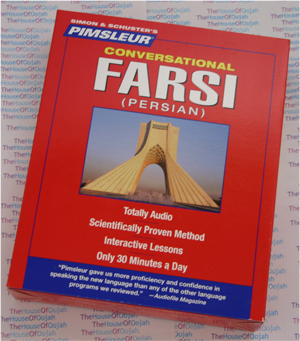 Best of all, the Pimsleur Farsi course does not waste your time by cramming grammar down your throat. You learn to recognize what sounds right through practice. The Pimsleur approach's subtle grammar lessons won't seem like grammar lessons at all. is an Iranian language within the Indo-Iranian branch of the Indo-European languages. It is spoken in Iran, Afghanistan, and Tajikistan and has official-language status in these three countries. Persian has been a medium for literary and scientific contributions to the Islamic world as well as the Western. It has had an influence on certain neighbouring languages, particularly the Turkic languages of Central Asia, Caucasus, and Anatolia as well as Urdu, Hindi, and other Indian languages. It has had a lesser influence on Arabic and other languages of Mesopotamia. For five centuries prior to the British colonization, Persian was widely used as a second language in the Indian subcontinent; it took prominence as the language of culture and education in several Muslim courts in South Asia and became the "official language" under the Mughal emperors. Only in 1843 did the subcontinent begin conducting business in English. Evidence of Persian's historical influence there can be seen in the extent of its influence on the languages of the Indian subcontinent, as well as the popularity that Persian literature still enjoys in that region. Persian belongs to the Western group of the Iranian branch of the Indo-European language family, and is of the Subject Object Verb type. The Western Iranian group contains other related languages such as Kurdish and Baluchi. The language is in the Southwestern Iranian group, along with and very similar to the Larestani and Luri languages. Persian, the more widely used name of the language in English, is an Anglicized form derived from Latin, a Hellenized form of Old Persian Parsa. According to the Oxford English Dictionary, the term Persian seems to have been first used in English in the mid-16th century. Native Persian speakers call it "Fārsi" (local name) or Parsi. Farsi is the arabicized form of Parsi, due to a lack of the /p/ phoneme in Standard Arabic. In English this language is historically known as "Persian". Some Persian-speakers migrating to the West (particularly to the USA) continued to use "Farsi" to identify their language in English and the word gained some currency in English-speaking countries. "Farsi" is encountered in some linguistic literature as a name for the language, used both by Iranian and by foreign authors. However, The Academy of Persian Language and Literature has declared in an official pronouncement that the name "Persian" is more appropriate, as it has the longer tradition in the western languages and better expresses the role of the language as a mark of cultural and national continuity. Some Persian language scholars also have rejected the usage of "Farsi" in their articles. The international language encoding standard ISO 639-1 uses the code "fa", as its coding system is based on the local names. The more detailed draft ISO 639-3 uses the name "Persian" (code "fas") for the larger unit ("macrolanguage") spoken across Iran and Afghanistan, but "Eastern Farsi" and "Western Farsi" for two of its subdivisions (roughly coinciding with the varieties in Afghanistan and those in Iran, respectively). Ethnologue, in turn, includes "Farsi, Eastern" and "Farsi, Western" as two separate entries and lists "Persian" and "Parsi" as alternative names for each, besides "Irani" for the western and "Dari" for the eastern form. A similar terminology, but with even more subdivisions, is also adopted by the LINGUIST List, where "Persian" appears as a subgrouping under "Southwest Western Iranian". Currently, VOA, BBC, DW, and RFE/RL use "Persian Service" for their broadcasts in the language. RFE/RL also includes a Tajik service, and Afghan (Dari) service. This is also the case for the American Association of Teachers of Persian, The Centre for Promotion of Persian Language and Literature, and many of the leading scholars of Persian language.